The food truck is a full restaurant on wheels and students will be able to gain experience interacting with customers, cook a wide range of cuisines and learn restaurant skills. ST. CHARLES, Mo. – An area school district is getting creative by combining a food truck and the classroom. Francis Howell School District partnered with their food service provider, Sodexo, to launch a food truck as part of an extension to the district’s culinary arts curriculum. The truck was purchased with funds provided by Sodexo. As part of the district’s contract with Sodexo, the company makes certain capital investments in the food service program, such as the food truck. ‘Food for Thought’ will be ran by trained Sodexo personnel with help from Francis Howell School District high school culinary arts students. The food truck will serve international cuisine with menus designed by students. The truck will travel to different schools within the district and offer meals that meet the national school lunch program requirements. The food truck meal will be an extra option, not a replacement for the regular school meal program, and the school cafeteria will remain open when the truck visits. Food truck meals will be accessible by all students, including those participating in the free and reduced lunch program. Students will be able to purchase a meal using their student meal account, according to a press release from the district. "The food truck is a unique experience and will benefit students of all ages," said Food Service Manager and Head Chef Karin Mann. "Younger students will be able to experience a fun and healthy lunch, while older students will have the opportunity to acquire both business and culinary knowledge. It's a win-win opportunity in getting students ready for the real world!" 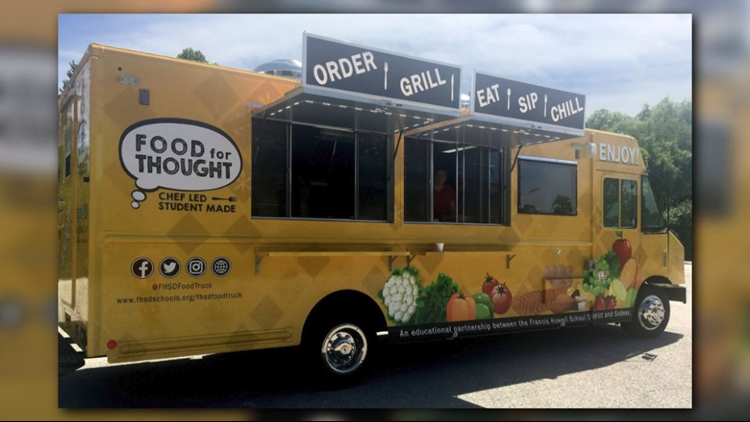 The ‘Food for Thought’ food truck will be available to Francis Howell School District school groups, clubs, and boosters to use for fundraisers. Interested in using the food truck for a fundraiser or booking it for an event? Contact Karin Mann with Sodexo at 636-851-6194.